Tailor made Orthotics - Holistic Health Systems Ltd. Custom made foot orthotics are appliances designed to improve the alignment of your feet as well as all the joints above your feet. Dr. Mark Leoni has been designing and custom fitting orthotics in Bangkok since 1995. The most common type of poor alignment of the foot is known as pronation which is usually found in conjunction with flat feet or fallen arches. The purpose of improving the alignment of the feet is that it is often crucial to improving the function of not just the feet, but the entire skeleton. Orthotics are particularly helpful in relieving pain in the feet, ankles, knees, hips and lower back. In some circumstances they can even help relieve neck pain and headaches when poor alignment of the feet is affecting the overall alignment of the entire skeleton (see below). They are usually made in pairs, whether you perceive you only have a problem on one side or not. Most people have a very noticeable problem on one side while upon examination they are found to also have a milder problem on the other side. To get perfect alignment of the entire skeleton, both the major and minor problem need to be corrected with a pair of orthotics. One of the primary functions of your feet is to absorb the shock associated with striking the ground each time you take a step. A healthy arch is required for the foot to perform its shock absorbing role. 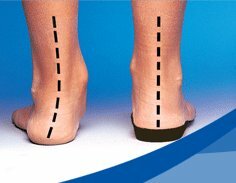 Orthotics improve the function of the arch allowing this shock absorption to take place. Without this shock absorption, a lot more of the forces associated with striking the ground are transferred up to your ankle, knees, hips and spine. Orthotics are simply slipped into your shoes and worn while performing most of your regular activities. Notice in the picture above how too much weight is placed on the inside of the left foot and how the weight is more evenly distributed on the right foot with an orthotic placed under the foot. Orthotics change the way you distribute weight on your feet so you no longer concentrate too much weight in any particular part of your feet. The Skeletal Biomechanics of a Misaligned Foot. This diagram demonstrates the far reaching effects of a misaligned foot. Notice how the left foot rolls inward (pronates) causing a flat foot. As a result of the fallen arch you can see how the entire leg turns inward while the knee tilts inward (knock knees). The resulting knee strain often causes knee pain. It is for this reason that knee pain is one of the most common complaints of people with abnormal foot alignment. If left uncorrected, the abnormal pressure exerted on the knees will cause them to wear prematurely. This can eventually lead to meniscus problems, usually in middle age and arthritis with advancing age. The time to act on your foot problem is before these changes take place. Sadly, most people wait until they have a painful condition before acting. Taking a proactive approach before you develop these problems, even if you have no pain now is a wise preventative strategy. Looking above the knee, notice how the pelvis drops lower on the involved side. 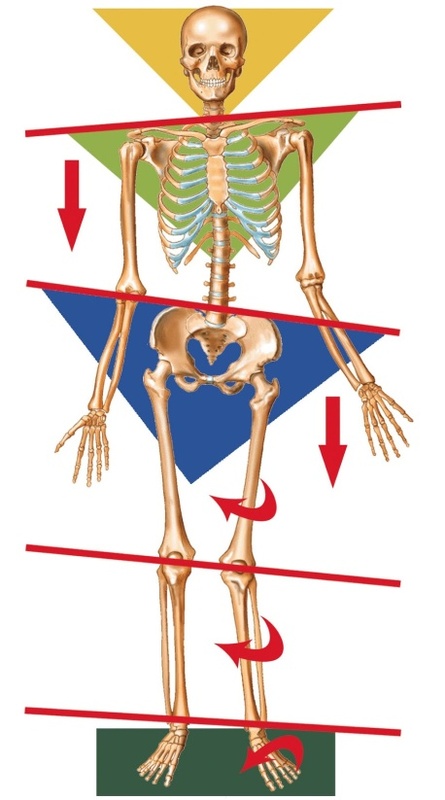 This causes 3 distinct negative influences on skeleton; 1) Uneven weight distribution through the hip joints. This causes abnormal wear to the hip joints which eventually can cause arthritis in these joints. 2) Uneven weight distribution through the sacroiliac joints. These are the 2 large joints in your pelvis. When weight distribution is uneven between these 2 joints, they become irritated which leads to scar tissue formation which causes them to become immobile (stiff). It is critical for your sacroiliac joints to stay mobile (freely movable) to reduce shock to your lower back associated with walking. Poor function of the sacroiliac joints is almost always at least part of, if not the entire cause of most lower back pain syndromes. 3) The lower back usually curves to the low side. The curving in the lower back leads directly to lower back pain. Looking above the low back, notice how the rib cage and shoulder girdle tilt in the opposite direction of the pelvis. This is a common compensation that can ultimately create strain in the muscles way up in the neck, leading to chronic neck strain. When you understand how abnormal foot alignment affects the alignment of your entire skeleton, it is easy to understand how it can contribute not only to foot pain but to pain in so many other joints. Orthotics are used both to treat pain and to prevent pain in those people who have poor alignment of the feet. The preventative aspect of orthotics is especially relevant to children as poor foot alignment is something you are usually born with. When the problem is identified early in life, during childhood, wearing orthotics can foster the development of ideal alignment of the feet and entire skeleton through to adulthood, thus preventing the onset of many bone and joint problems later in life as described above. We design several types of orthotics. The type of orthotic we design for you will be made based on your specific needs. This relates to the specific problem you have, the type of activities you participate in, and finally your preference in footwear.